Michael Duffy: As it happens, we’re going to start the year with a guest from the right, but so far to the right you certainly couldn’t call him conservative. I’m not sure what you’d call him, he is right out of the ideological ballpark. His name is Hans-Hermann Hoppe and he’s a German intellectual who lives in America. He’s going to propose ways of thinking about government, society and the economy that are literally radical. Paul Comrie-Thomson: And I think in this case, Michael, the word ‘literally’ is being used literally. Michael Duffy: Indeed it is. 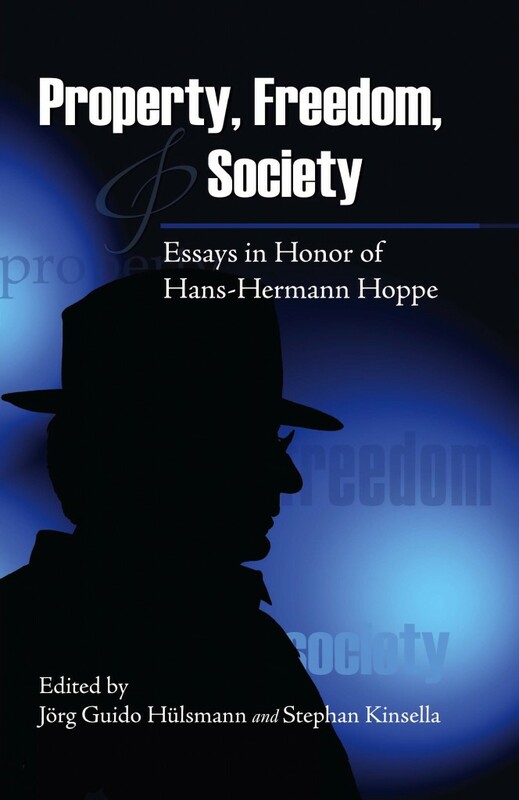 Hans-Hermann Hoppe is probably the world’s leading living libertarian philosopher. He’s emeritus professor of economics at the University of Nevada, Las Vegas, and a distinguished fellow at the Ludwig von Mises Institute. Perhaps his best-known book appeared about a decade ago, and it had the challenging title Democracy: The God That Failed. His critique was from the libertarian right. Libertarians are part of a pretty broad church, so how would Hans-Hermann Hoppe describe his position? Just where is he coming from? Hans-Hermann Hoppe: I am a libertarian but there exists various wings of libertarians. I am a member of the wing that is referred to as the anarcho-capitalist libertarians or, as I prefer to say, I’m a proponent of a private law society, and a private law society is a society where the same laws apply to every individual and every institution, not just separate groups of individuals—government officials on the one hand and private citizens on the other—to whom different laws apply. Michael Duffy: In general terms, is there one particular place that you’re coming from? Is there a sort of fixed point where you start whenever you consider a new subject or a problem? Are you interested in freedom, for example? Hans-Hermann Hoppe: Of course I’m interested in freedom. I think freedom is defined precisely by the position that I take, that every individual and every situation is subject to exactly the same law and there is no group of individuals or no particular individual that has certain privileges that other people do not have. Michael Duffy: Okay, let’s apply those beliefs to what you’ve written about the differences or the comparison between democracy and monarchy. I suspect most of our listeners would consider that democracy is a marked improvement and a dramatic difference from monarchy. How do you see the two? Hans-Hermann Hoppe: First you have to define a state because monarchies as well as democracies are states, and then in the second step we have to explain what the difference between these two types of states are. States are defined as institutions that are the ultimate arbiter in cases of conflict on a certain territory, including conflicts involving the state itself. And secondly, states are territorial monopolies of taxation. So this applies both to monarchies and to democracies. In monarchies, the head of the state considers the territory as his private property, and the people inhabiting the state territory as his renters who owe him rent payments. And of course he uses his privilege that he has as the ultimate arbiter in any case of conflict and a person who has the right to tax individuals to his own advantage. He exploits his population. This is also true in a democracy. Taxation exists in a democracy, just as much as it exists under monarchy. Democratic states also assume that they are the ultimate arbiter in any case of conflict, including conflicts involving themselves. Michael Duffy: But people choose this, don’t they? People will vote for democracy, for democratic governments. Hans-Hermann Hoppe: Yes, that brings me to the difference between democracy and the monarch. Under monarchy it is relatively clear who the ruler is and what the rules are, under democracy you can hope that you will end up on the other side, that you will be on the receiving end, and that reduces the resistance against increases of taxes, against unjust verdicts in conflicts of a situation. But the most important difference between monarchy on the one hand and democracy on the other hand is that you replace somebody who considers himself to be the owner of the country with somebody who is a temporary caretaker of the country, and that does not improve matters, it makes matters much worse. To give you an example, if I give you a house, in one situation I make you the owner of the house so you can determine who will be the heir, you can sell the house off and keep the receipts from the sale, while in the other case I make you the temporary user of the house. You can use to your own advantage the income that you can get off the house but you have no right to sell the house, you have no right to determine who will be the heir of the house. Will you treat the house in a different way? And the answer seems to be quite clear; yes, you will treat it in a very different way. In the one case as the owner you will be interested in preserving the value, the capital value embodied in the house. In the other case, as a democratic politician where you can only use the house but don’t own it, you will try to increase your income that you can get from the house without any regard to the capital value embodied in the house, and you will engage in capital consumption, you will want to rob the country as fast as possible because, after four years or eight years you have no chance anymore to do it. So it is far more destructive of wealth formation than monarchy. Michael Duffy: But isn’t it the case, using your analogy, that because of elections if I want to keep the house, keep my control of the house at the end of a period of four or five years, I have to act within certain limits? In other words, elected rulers, even if they do exploit people a bit, they have to keep that exploitation within boundaries in the hope of being re-elected. Hans-Hermann Hoppe: But this is also true for monarchs. Monarchs have frequently been killed if they overstep their boundaries, and the dynasty of which they are a member is very much interested in keeping the dynasty in power. Democrats are far less frequently killed because people always have the hope that in four years somebody else will come to power. So the resistance against attempts to increase government power to increase the amount of taxes is far lower under democratic conditions than it is under monarchical conditions. And in addition it should be said that competition for entry into government, competition is not always good. Competition is good when it comes to the production of things that are good. We do not want to have a milk monopolist, we do not want to have a car monopolist, we do want to have competition in the milk industry and the car industry, but competition is not good when it comes to producing something that is bad from the point of view of property owners. We would not want to have competition in people­—who runs the best concentration camp, who is the best mugger on the street—and this is precisely the type of competition that we have in democracy. Michael Duffy: It’s the case, isn’t it, that democracies on the whole have higher standards of living than other forms of government, and also the case that many people who do not live in democracies would like to, to the extent that we can gauge what they want. Why is that so, do you think? Are people deluded to want to live in democracies? Hans-Hermann Hoppe: Democracies have won out in competition against monarchies in the course of history. The monarchical age has ended by and large with the end of World War I, so it would be unfair to say that democracies are in fact richer than monarchies because we compare the 19th and 18th century with the 20th century. Societies can grow richer despite the fact that governments grow richer. So my thesis would be if we would have kept monarchies of the style that we had in the 19th and 18th century we would be far richer than we are currently under democratic conditions. Michael Duffy: Moving on, what might a libertarian society look like? How might it organise itself? Hans-Hermann Hoppe: The basic idea is that if every institution, every person is subject to the same set of laws, then also the production of law and order has to be provided by freely financed institutions. There is no monopoly institution in this place. This would lead to a situation where we would indeed get some sort of contract of what will happen to us in certain situations of conflict, what the provider of security of law and order will do. They will have to describe what it is that they will protect, how will they protect it, what will they do in the case of a conflict between a client of a protecting agency and the agency itself, what will happen in the case that two security providers and their clients have conflicts with each other. They will have to agree, for instance, that there will be independent arbitration in the case of conflicts between various protecting agencies, whereas if you compare that with the current situation, we have a situation where no contract exists between the citizens that are allegedly protected in their life and their property by the government, where it is not clear what will happen if the clients, the so-called clients of the state, are dissatisfied with the provisions that the state gives, where the clients have no possibility of appealing to independent third parties if it comes to a conflict between the state and the individual, where instead we have a situation where if you have a conflict with the state, some state agent, over property rights, it is another state agent who decides who is right and who is wrong in this case of conflict. And there you can predict of course what the outcome will be; they will by and large decide that they are always right. Michael Duffy: Can I ask you for an example? In this sort of world you’re describing, say there was a law and everyone else agreed with it but I didn’t. So if, for example, I live in a street and I’ve got a one-hour parking sign out the front and I disagree with that but the other people in the street agree with it, what might happen then? I’m just trying to get a concrete idea of this. Hans-Hermann Hoppe: The street would be privately owned. In a private law society there exists no such thing as public property, there exists only private property, and of course the owner of the private property lays down the rules that apply to this piece of private property. So conflicts like this would not even arise. Public property, on the other hand, generates conflicts. Allegedly we all own it. If we do not happen to agree, as if by magic, conflicts are almost unavoidable. If the unions want to demonstrate on the street and the car drivers want to drive on the street, both claim to be owners of this territory, and conflict is unavoidable. If everything is privately owned, it is perfectly clear whose rules apply and whose rules do not apply. Michael Duffy: So if I own a house in a street, would that street belong to all the people in the neighbourhood or to another company? How would that work? Hans-Hermann Hoppe: That can be arranged in various ways. It might be owned by all the residents on the street, it might be owned by a third party and you have the right to access your property. Obviously nobody would buy any property if he did not have the right to access his own property, so you would have a contract with the person who owns the street. Or there are neighbourhood associations that jointly own the street and make joint decisions, as in stock companies or as in gated communities or institutions of that kind. Hans-Hermann Hoppe: And then you could leave. Michael Duffy: In Australia we have a large number of people who are on welfare, poor people who are looked after by what we call the welfare state, possibly more than in America. What would happen to those people under the sorts of arrangements you’ve been describing? Hans-Hermann Hoppe: First of all I think that a large number of voluntary organisations would spring up, voluntary donations would dramatically increase given the fact that no taxes have to be paid. Currently the situation is such that you pay massive amounts of taxes and then people of course have the feeling why should I also support people who have this condition or that condition given that I am already paying an enormous sum of taxes. Second, I think there would be greater pressure exerted on people not to become dependent on welfare because they are not entitled to it. They would have to behave in such a way that they satisfy their donors in some way, they have to be nice to their donors, whereas currently the situation is you feel entitled to these things and that breeds of course bad behaviour. Whatever you subsidise through taxes you will get more of it. If you support poor people, this does not eliminate poverty, it increases poverty, it increases the incentive to stay poor or to become poor. Whenever you subsidise people because they suffer from drug addiction or alcoholism, you increase of these forms of behaviour instead of discouraging them. Michael Duffy: Do you think the welfare state can survive? Hans-Hermann Hoppe: No, the welfare state will ultimately collapse for the same reason that communism collapsed. All Western welfare states will not be able to repay their debts, will not be able to fulfil their obligations that they have assumed vis-à-vis people who are retiring. The only way that they can fulfil it is by engaging in a massive amount of inflation, that is printing up the money in order to give the impression that they might fulfil the obligation, with the consequence of course that the purchasing power of money drastically falls and an expropriation of productive individuals will take place. Michael Duffy: I’d like to ask you a bit more about economics but unfortunately we don’t have a lot of time left. Just very generally, can you tell us a few of your most important thoughts about how you think the international financial system ought to be arranged differently? Hans-Hermann Hoppe: The fundamental problem that we have which began in its most drastic form since 1971 is that all governments are nowadays on a pure paper money standard. All governments or their central banks can create money out of thin air. Increasing the amount of money in existence does not increase wealth in society, it is just additional pieces of paper. There is not one additional consumer good resulting from more money being printed, there is not one additional producer good resulting from more money being printed. If by money printing we could make societies richer, there would not be a single poor society. In fact, there would not be a single poor person on earth. All that this money printing does is redistribute income and wealth from those people who print and get and spend the money first, and it impoverishes and expropriates who do get the newly printed money last, who are on fixed incomes and are confronted with rising prices resulting from the fact that additional money was being printed. So the most important monetary reform that we can hope for would be the abolishment of all central banks and the return to a situation that existed for most of mankind, namely a situation where money is a regular commodity that must be produced in a costly way, such as gold and silver, by the market. Again, no monopoly in the production of money but competition in the production of money, and money being a regular commodity that cannot be generated out of thin air. Michael Duffy: What about the role of intellectuals? We’ve never had anyone like yourself on our program before and that is disappointing. Why don’t more people think like you or it least engage in more diverse thinking about freedom? Hans-Hermann Hoppe: The answer to that one is very easy. Most intellectuals are state employees, and of course they know where their money comes from. While that fact does not determine in the Marxist way how people think, it definitely helps to know where your money comes from. The demand for intellectual services on the market is far lower than the impression that intellectuals themselves tried to spread. Their salaries would probably be significantly less, there would be significantly less so-called intellectuals because they realise that their biggest helper is the state. They tend to be in favour of state institutions, tend to be in favour of having public education, public funding for research. Again, most research that is being done, especially in the social sciences, appears to me as a big waste of money. Societies would be richer if many of these so-called research projects had never been carried out at all. Michael Duffy: Professor Hoppe, thanks very much for your time today. Hans-Hermann Hoppe: Thank you very much. Michael Duffy: Hans-Hermann Hoppe is emeritus professor of economics at the University of Nevada, and a distinguished fellow at the Ludwig von Mises Institute. In coming weeks here on Counterpoint we’ll be talking to another prominent libertarian, David Hart. He’s an Australian historian, now resident in the US, a self-described ultra-sceptic who runs the important website, the Online Library of Liberty, and we’ll hear his views on freedom, war and the growth of the state.